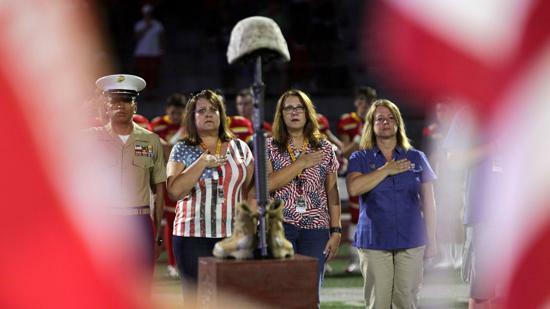 The pregame ceremony, featuring a Marine Corps color guard flanked by wounded veterans, Gold Star moms and wives and the planting of the Battle Cross, was as inspiring as it gets at any football game — high school, college or NFL. What happened to Cathedral Catholic after that in the nightcap of the Honor Bowl was anything but special. The Dons got pushed around by a big, fast, strong Orange Lutheran team, losing 37-0. Orange Lutheran is ranked No. 12 in the state by MaxPreps. This was the first time Cathedral has been shut out since losing 10-0 to Torrey Pines in 2010. Cathedral, which was 15-0 and Division 1-AA state champion last year, lost to Loomis Del Oro last week. The Dons last opened the season 0-2 in 2015, losing to Santa Margarita and Oaks Christian in the Honor Bowl at Oceanside High. Cathedral went on to finish 7-5. "This is in no way an excuse, but most of the night we had three sophomores and a junior on the offensive line," said Cathedral coach Sean Doyle. "We're going through some growing pains, but we're learning. That's what counts. "We don't shy away from good teams. We want to learn and go forward. We'll be there at end. That's the goal. That's what we've always done." The Orange Lutheran defense swarmed the Dons, keying on swift junior running back Shawn Poma. He had 17 carries for 20 yards and was thrown for a loss seven times. Cathedral Catholic rushed 33 times for 67 yards and completed just 3 of 11 passes for 28 yards as Nipa Tuiahi, Drew Cornelius, Jonah Laban, Talik Sekona, Javier Jimenez and Joseph Forrest seemed to live in the Dons backfield. Highly touted Orange Lutheran junior quarterback Ryan Hilinski lived up to his billing, completing 18 of 24 passes for 217 yards and a pair of scores. "Before the game, a Marine who had lost his legs in combat talked to us," Hilinski said. "That really touched me. "In the first quarter, I got hit on the leg and hurt. Then I remembered the Marine who talked to us didn't have legs."